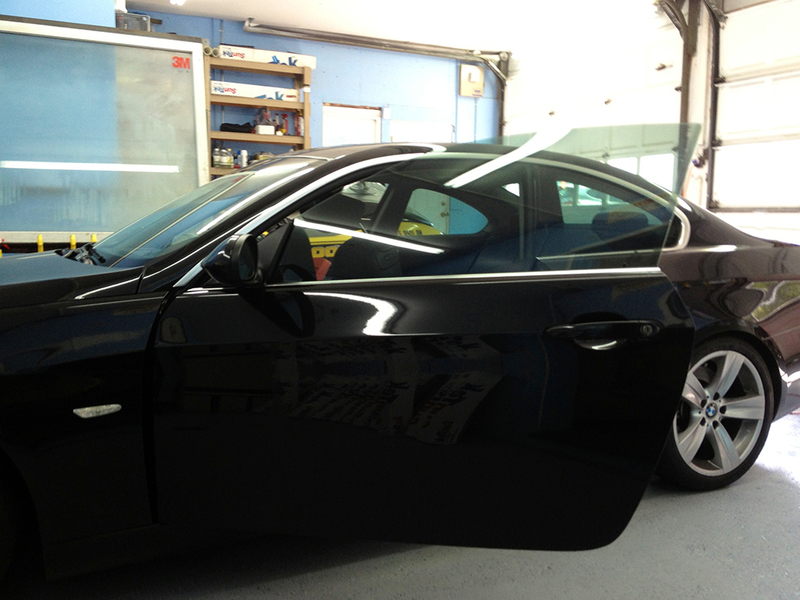 is a 335i coupe. The 5.5 reached the end, it was time to call it quits. 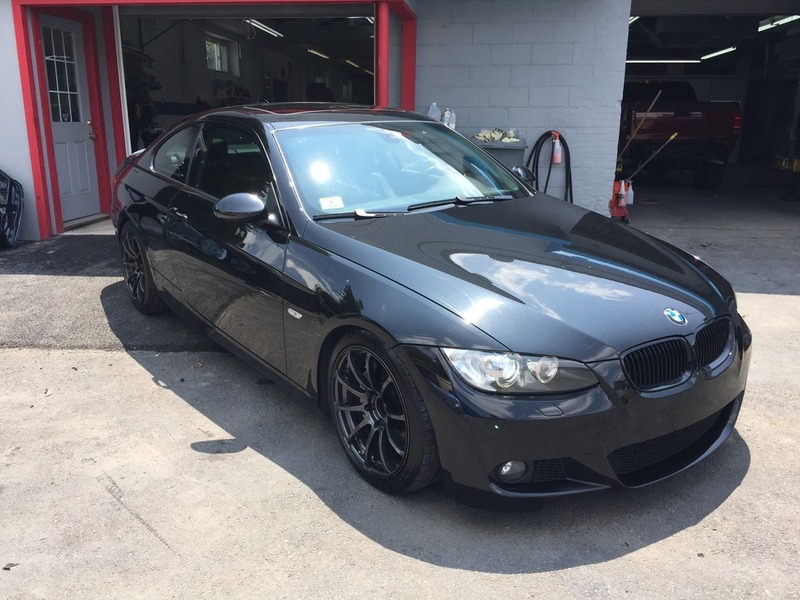 2007 335i 6MT, Black Sapphire Metallic on Black Dakota leather. Sport, Premium, Cold Weather. At the wash. Don't worry, only using the water there. Parked next to S/C S2000 and single turbo RX7. Hopefully more pics to come soon. Last edited by zero2sixtyZ; 07-13-2015 at 06:56 AM. Thanks! Most of the New England guys around have moved onto a new platform. I did love my Maxima, but the 5.5 was the last version for me. Very nice! 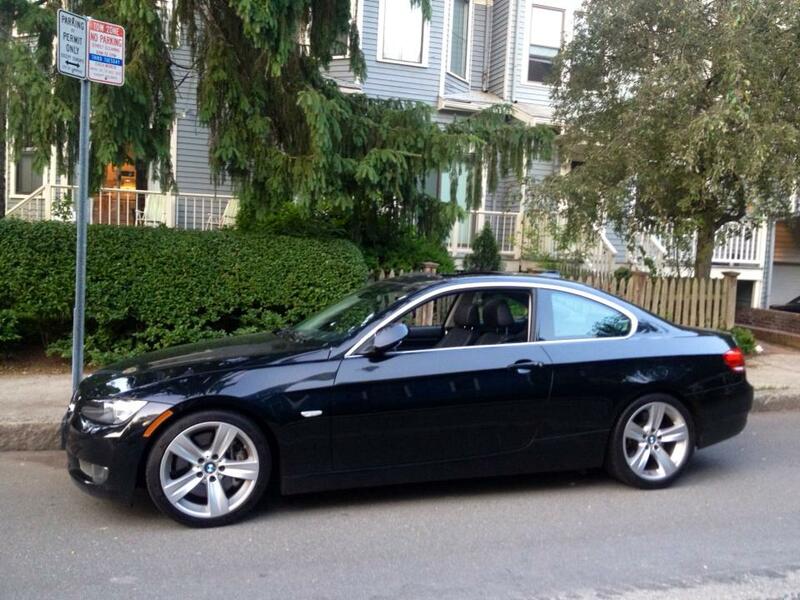 I just picked up a 5 series. BMW seems to be a good upgrade after the Maximas. I'm assuming you're wrapping the wood trim with CF vinyl? Ah, yes. That does look good. I saw that also but wasn't sure how flexible it was and how hard it would be to wrap around tight edges compared to the other stuff. Have you considered the Msport pedals or covers also? Adds a nice touch and flows well with the other pieces. I will be looking at pedals eventually. They are a bit lower on the list, and I'd like to see if the F30 M-sport pedals can be used. Congrats on a fun car to play with. Your Maxima reminded me of how mine used to look with the Tracks and kit. Still miss it, but with cars, when its time to move on its time to move on. Thanks Puppetmaster! I still remember how your 5.5 looked. The 245 width S-Drives on the Tracks you had sold me. I wanted that look. Sigh, I'll miss the Max a lot, but hopefully can add some of the same taste to the 335. A "single" turbo, eh? You're killing me, man. Very happy for you, Zero. Thanks, Rochester! It was time. Samuel1021 tells me about how you brought the entertainment to the G forums, haha. He converted from twin to single recently, but has had issues tuning. Last I heard he couldn't rev it over 5000 rpms, and still put down 380whp. Once he gets it under control, he should be able to do the full 9. Last edited by zero2sixtyZ; 08-09-2013 at 01:23 PM. IDK who Samuel is, but yeah... I hang out in the Sedan forum on MyG37, like I used to here in the 5th Gen forum. 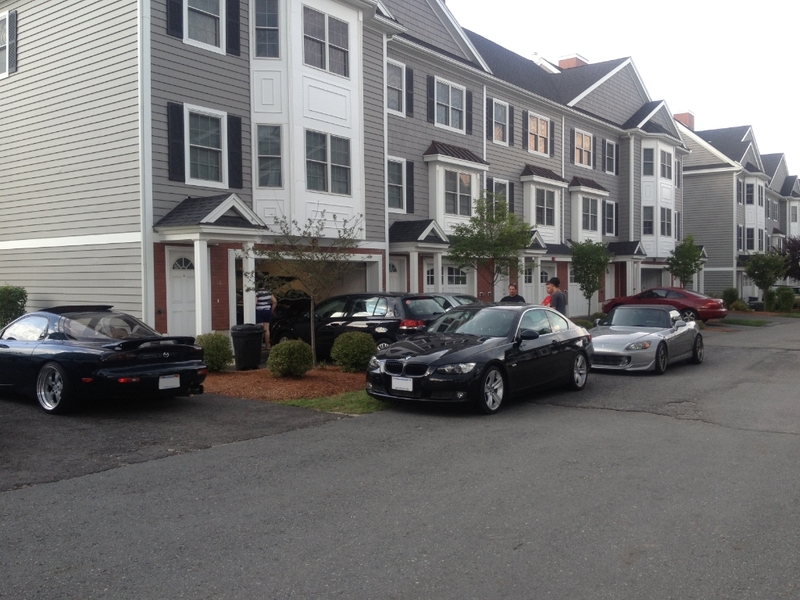 Mostly a bunch of renters, but there are some cool people, too. It's my car forum home now, such as it is. Hmm... good luck finding anything but dbags and daddy's money on the bimmer forums. BMW owners aren't that stereotypical are they? Well, guaranteed Zero doesn't fit that mold. So there's hope for the bimmer community yet. Haha, thanks guys. It's the same story as all forums. There are voices of reason to listen to, like Rochester, and then there are people who will ask "do you stance?" You tune The latter out, and abuse the search function for a while. I will admit I have had the urge to pop my collar, but I am fighting it. Well, the 335 has a head start in the power department for sure, lol. Looking forward to seeing any mods you have lined up. I actually sold my maxima and moved on to a BMW as well. 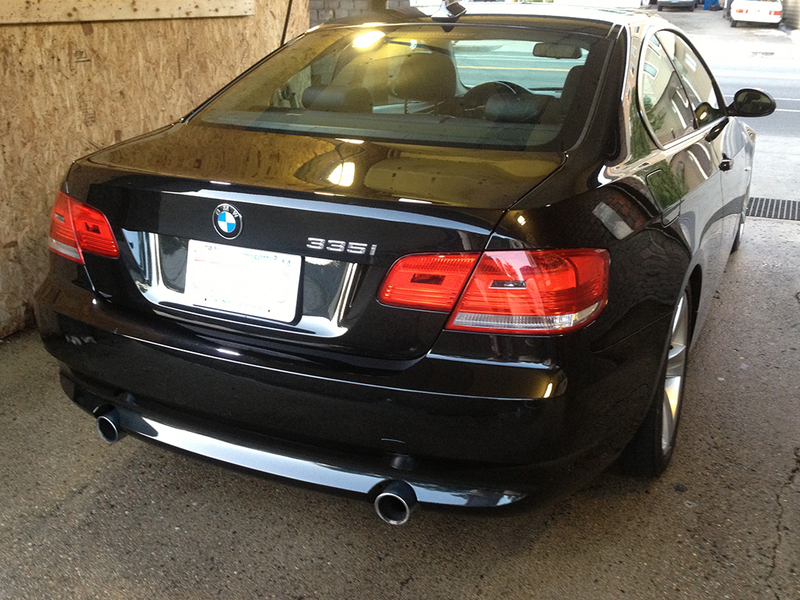 Granted it is not a 335i but a somewhat special 330i zhp. I am a huge advocate for the E46. Have friends with a 330Ci w/ muffler delete (orgasmic pure I6 sound) and an E46 M3. Great cars. Car is finally running an updated tune. In the E9X community, ECU flashing went open source. No cost for a utility + specific cable. 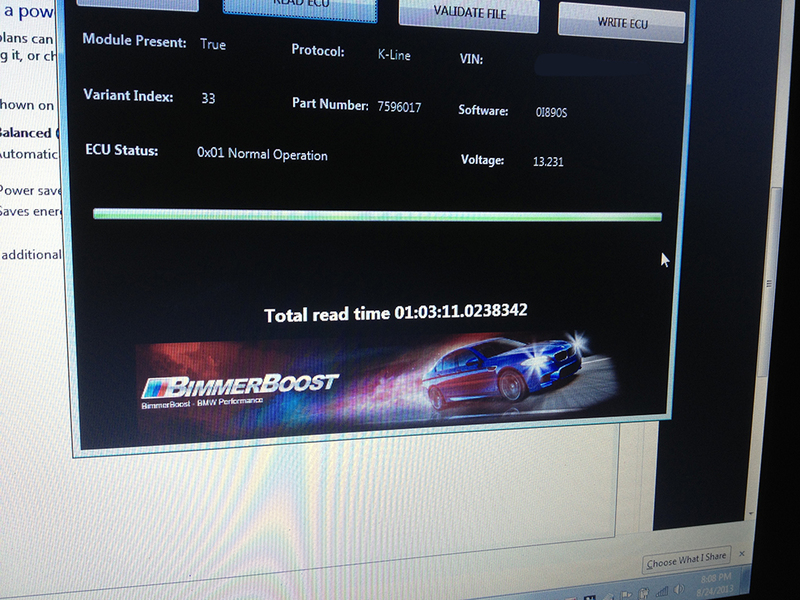 Used the new BimmerBoost Flash utility to upload the BMS JB map. From previous dynos, should expect a 80whp/100tq increase and much stronger midrange. Went to the same place that did the tint on the Maxima. Solar Solutions in Bedford, MA. 35% SunTek Carbon all around. Started on the trim wrapping... didn't like the 3M dinoc stuff. Covering the wood trim in 3M 1080 Brushed Black vinyl. No pics yet, but GP Thunder fog light bulbs swapped in, and hoping to either paint black or replace the lower grilles this weekend. Brushed aluminum look is vastly better than wood, IMO. Nice choice. After helping Samuel1021 with his on the G35 per DIY from myG37, I'll be ordering some 3M Gloss Black vinyl as well to do the window trim. Also, swapping out the rear tires for Pilot Super Sports in 265 width this week. Little bit of a wider patch will definitely help with traction. Once those are done, I should be good for Fall... then to start setting aside play money for M-Sport bumpers and power mods. I've got PSS in the rear, and will be matching in the front next Spring. Amazing tires. You will be pleased. That wrap job looks amazing. Got a link to where you got it? I'm not feeling the black cf dinoc I did in mine. Glad you're confirming. I've read nothing but good things about them. Doing the same purchasing. Rears are gone but front tires will be replaced next season. I purchased the smallest amount to play with at first, and will be buying the rest from a local shop. At the time, I was very worried about increased understeer, because the G was predisposed to plow when pushed hard. So having sticky PSS in the rear, and the OEM Bridgestone Summers in the front, I was worried... but it just didn't happen. In fact, the opposite happened, and there was more control. Then a few weeks later I installed a set of Eibach swaybars, and understeer just disappeared entirely. 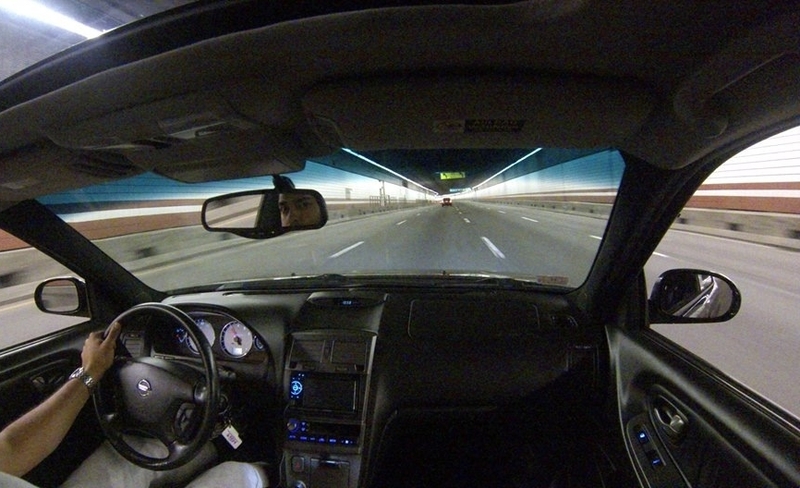 If I attack a highway ramp now (with the traction control off) the car will drift before the front end gives. No understeer, no oversteer unless I intentionally kick the back end out... just drift. It's an amazing thing. My fronts won't pass inspection anymore. But just a few more months, the snows go on and I'm done with them. Hmmm... which Bridgestones did it come with? Does the front feel squirmish during nose dive, etc? The sport package usually comes with Potenza RFTs as but luckily this one came with the Michelin PS2 ZP option. Grip is great, however, runflats are the worst thing ever. Extra weight, and crashing over bumps like each wheel has a grudge with the ground. Looking forward to the PSS'. Hopefully I can have some fun with more grip and better ride comfort before the season is out. My rears wouldn't pass inspection, and the tune made the wear worse... correction, my constant acceleration testing has made them worse. Hmmm... which Bridgestones did it come with? Bridgestone RE050A. Three season, maximum performance tire. It's good rubber, but the tread life is only 10k to 15k in normal, real-world driving. I barely got 10K out of the rears. And as good as it is, the PSS is better. As for feeling "squirmish" (LOL), like I said, there was a fair amount of understeer. But that all went away after the swaybar upgrades. Which is funny, in a way, because the RWD-Sport G already has beefed up swaybars, so you can imagine how sloppy the base-model G is. Last edited by Rochester; 09-09-2013 at 01:31 PM. my constant acceleration testing has made them worse. 80 hp/100tq on tuning upgrade alone?? woah! Roch - did you just upgrade rear sway bars or fronts too? (not sure if there are fronts) just wondering. Yes, give or take. My boost levels went from the stock 8ish, to 15-16 in the midrange. Meaty! I believe we can upgrade to the M3 convertible sway bars. Will need to look into that after the LSD... Not the drug. 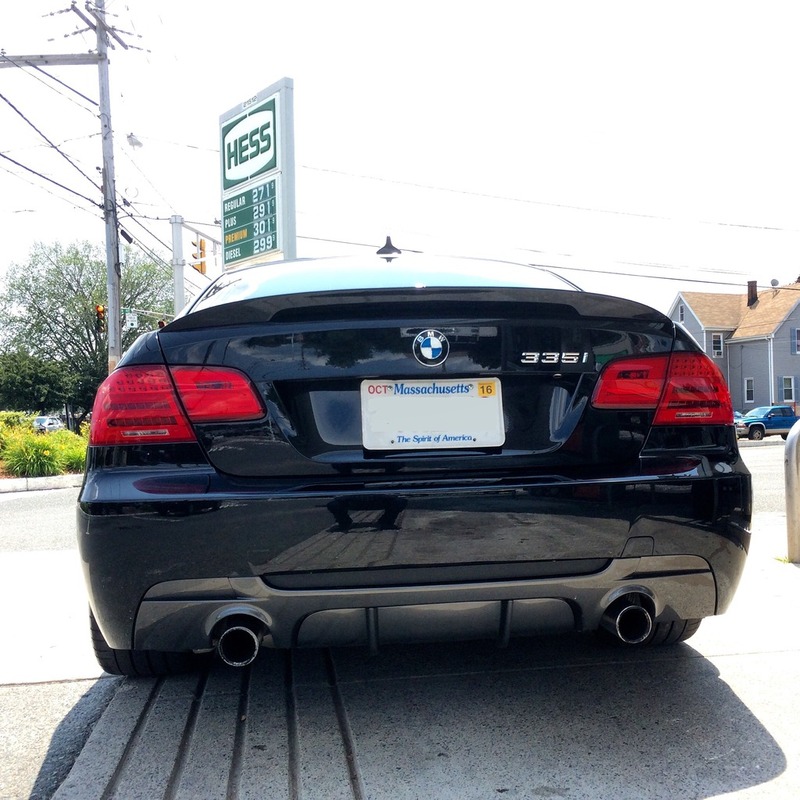 Pic from this weekend right after install and a 4 hour drive to NY... 265 width Super Sports in the rear just installed. Tire p0rn. So how's the handling and the launch? And on another note... GD your wheels are filthy. 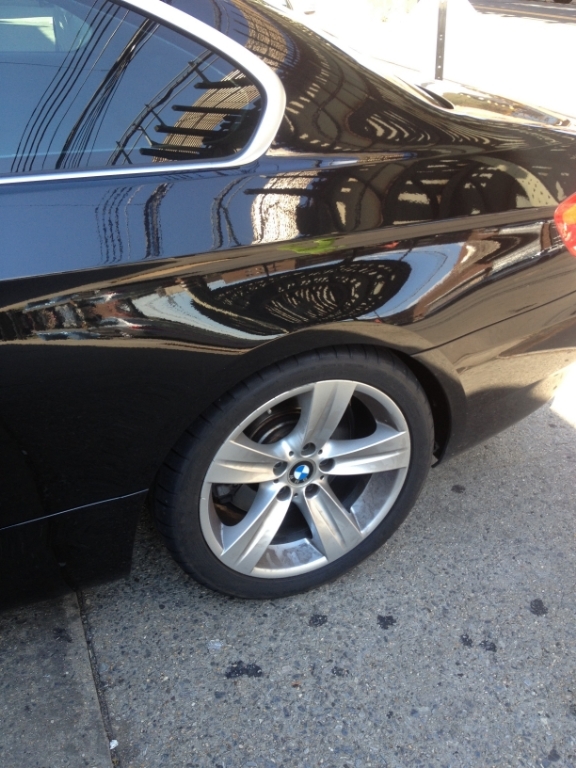 Before it gets too cold outside, be sure to wash, clay and wax those rims. The tires feel great. I don't do a lot of hard launching in general, but when I do.. rear end is stable, and no drama. The car was washed five minutes after this picture, but yes, these damn OEM pads dust badly. My OEM fronts are almost bald, and I just need to get through Fall with them. Lately I've started understeering again when pushing hard into a turn. Makes me sad. Next Spring will be awesome, though! With solid tread PSS all around. Can't wait. Nice ride. You need to upgrade the front bumper or put on an aero lip for a more aggressive look! And at 16psi boost, you may look into upgrading your charge pipe to prevent boost leak, or worse, the CP blowing up. My stock diverter valves started leaking after 4 months @ 15psi. Which one are you thinking of? Quaife? M3? Wavetrac? They do dust really badly! I can never keep my rims clean, but they grab on so well though. ... so you picked another black car hey! So that's true what they say, once you go black, you can't go back! Last edited by Gizm0; 09-19-2013 at 06:06 AM. I am looking into the M-Tech front eventually. Will do well for cooling, especially if I have a VRSF 7" FMIC peeking through. I might wait till Spring to be able to do the rear bumper, and M3 side skirts. 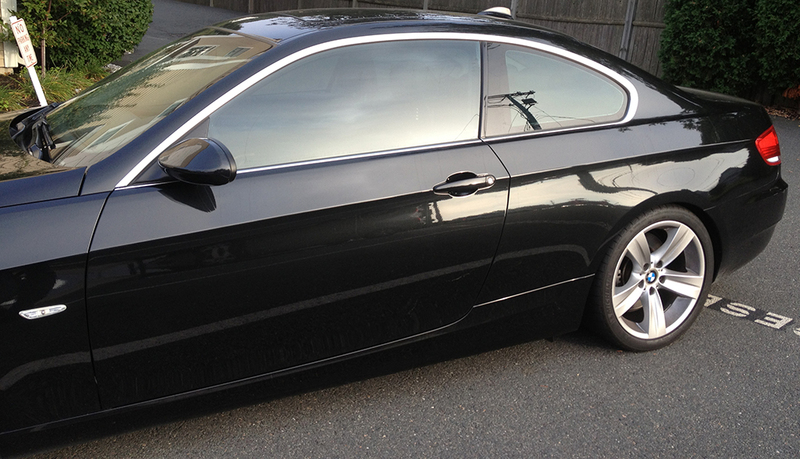 Kinda like the standard 5.5 bumper + Stillen front of the E92 world..., which I'm okay with. CP: I am researching charge pipes and BOVs at the moment. Looking for the best option, as the OEM one will not handle the boost. Definitely trying to source together the M3 one. I've heard noise complaints with the Quaife, and I'd like to have as many OEM parts as possible. I know the driveline will need to be mish-mashed, but if I get it right, I think it'll be worth it. Sadly, I didn't want the black one. I originally wanted an Alpine White, Space Gray or Sp. Graphite on Coral Red, but this was is better condition than the others. I hear that. 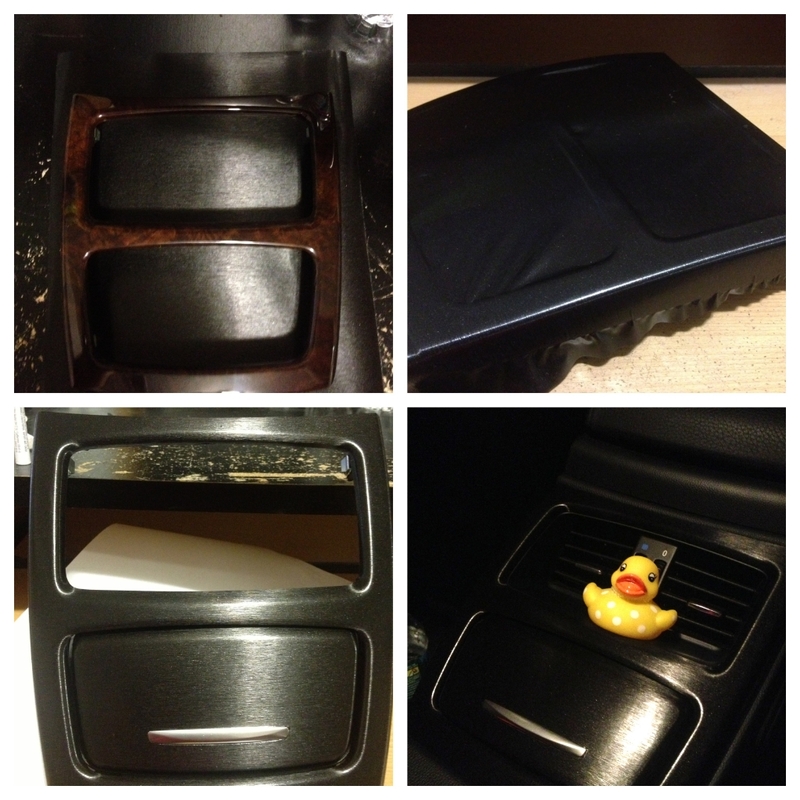 When buying a used car to very detailed specifications, things like paint color take a back seat to other priorities. Moonlight White was my second choice. And while I love the look of a 3-stage pearlescent color, I dread the day that it needs body work, because it will never, ever match. Period. Although I have to say, black was a deal breaker for me. I obsess over my cars, and there's no way I'd let THAT kind of obsession into my life. 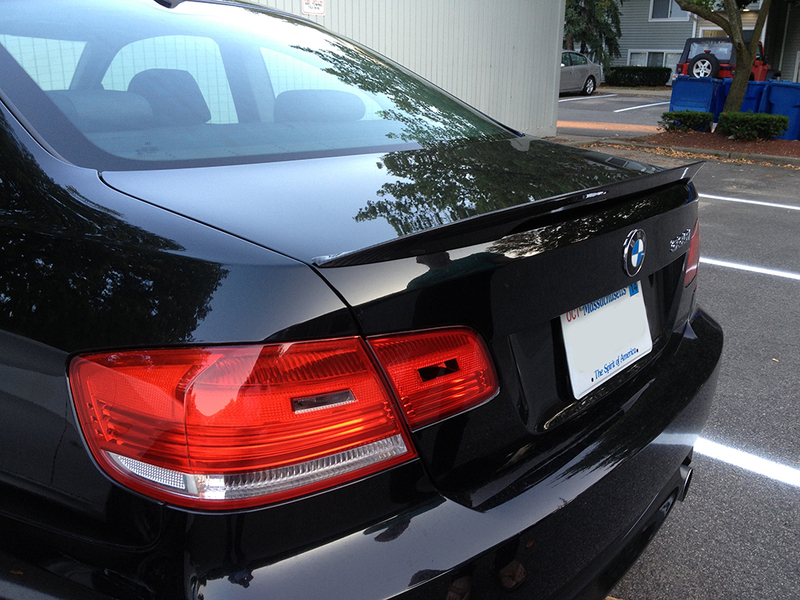 Keeping a black car in pristine condition is nuts. It will consume you.